Life is dukkha, said the Buddha. 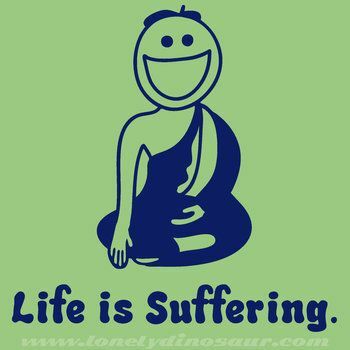 Dukkha is often translated as suffering or dissatisfaction. The word dukkha comes from a root referring to a wheel with the hub off-center. Imagine what it would be like to ride in a cart with the wheel's hub off-center. Life is a bumpy ride, Buddha was saying. Alternatively, dukkha refers to a dark space – the wheel’s hub is a hole, a dark space at the center. So another way to read dukkha is that it’s about recognizing that life has dark spaces – dark times come to us all. Buddha said this as the first Noble Truth in his very first sermon after his great awakening. Dukkha is the first point of the first sermon, and that sermon continues to be the first and central point of Buddhism. Why would anyone make suffering – or even dissatisfaction – into the starting point of a religion, or an approach to life? Now that’s the way to start off a religion, right? Good, good, good. Everything is very good. In Christianity, there is suffering. Jesus suffers considerably, but the point, we’re told, is that he suffers so we won’t have to. No suffering for us – so that’s OK. 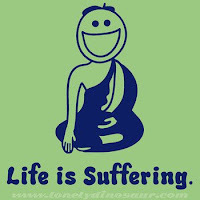 But why on earth would these Buddhists go for a religion that starts off saying life is suffering? Who needs that? The Buddha does have reality on his side. Genesis does, too. They’re both right. The land and the oceans, the plants and the animals, the sun, moon, and stars – life IS good. It’s also got some bumps on the ride, some dark spaces. Birth is unpleasant. Aging, sickness, death, sorrow and lamentation, pain, grief, despair, being around what you loathe, not being around what you love, not getting what you want – all of these are experiences that we all have or will have. This is reality, and reality is never depressing. Denying reality can lead to depression -- the exhausting struggle to avoid facing what is there eventually can leave a person depleted, enervated. When we face the bumps clearly, our life can be much better. And that is the wisdom of the Blues: When we face the bumps – the pain and grief – clearly, without trying to deny them, or push them away – when we “meet them at the door laughing and invite them in” (Rumi) – it makes life better. Through music and song, the blues addresses squarely the dukkha of misfortune, betrayal and regret. You lose your job, your mate falls out of love with you, your dog dies. You can try acting like everything’s fine when it isn’t. Better is to recognize that we need sadness. If you haven’t seen the cartoon movie, “Inside Out,” I recommend it. It’s about an 11-year-old girl, Riley, and the feelings inside her head: Joy, fear, disgust, anger, and sadness. As the movie begins, Joy is the primary organizer in charge, and Joy doesn’t see any purpose for Sadness. She wants to keep Sadness contained within a small space so she won’t touch anything. Joy doesn’t want anything to be touched by blue Sadness. She takes a piece of chalk and draws a circle and tells Sadness stay inside that circle. Perhaps you have wanted to relegate sorrow to a distant corner of your life. Of course, we’re not talking about debilitating depression. Mild, temporary sadness helps us cope with various aspects of life. The evidence suggests that humans evolved with sadness because our ancestors who got sad when faced with a difficult situation, could withdraw from the distractions of excitement and wonder, and were thus better able to work through the problem. Over the course of “Inside Out,” Joy learns that Sadness can do things she can’t. When Bing Bong, Riley’s imaginary friend, speaks of his traumatic past, all Joy can say is “Cheer up, get over it.” It’s Sadness who can be with – without trying to fix. It’s Sadness that can empathize – Sadness that can be an accepting presence. When Joy offers only distraction, Sadness offers comforting, accepting presence. Our sadness signals to others our vulnerability and invites others to a closer connection with you – and their capacity to welcome sadness allows them to accept that invitation. Your experience will surely bear this out: the friends that you’ve been through sad times with are the closest ones. The friends with whom you’ve shared only happy times: not so dear. This is part 1 of 3 of "The Blues"
Very helpful thoughts --thank you. Too often we think that feeling blue is a bad thing; yet blues is some of the best music we have, and for good reason. Of course the line between beautiful blues, on the one hand, and debilitating depression on the other, is not a sharp one. The one shades off into the other. Sometimes I think that learning to explore appreciatively the shores of beautiful blues --without drowning in a sea of depression-- is the main spiritual project we undertake in this life. It's a project that hurts at times, yet is full of rewards. I'd hate to have missed it.